There’s a lot of back-and-forth between SEOs on whether exact match domains are still worth using or if Google tends to down rank strictly because they can come across as being pretty spammy with “keyword-keyword-keyword” types of domains. This question was raised in the Google Webmaster Help Hangout video this week and John Mueller went into detail for about 10 minutes on this topic, so it’s well worth watching if you have an exact match domain or are considering using one. The biggest thing he says is that exact match domains (also referred to as EMDs) do not necessarily mean it’s a bad site. He said there’s plenty of examples where people have great experiences at exact match domain sites because they are still high quality sites. Likewise an exact match domain isn’t a shoo-in to be ranking well for the keywords that are in the domain. If the site is a bad site, Google will rank accordingly regardless of what keywords may be in the domain and whether they match the search query or not. 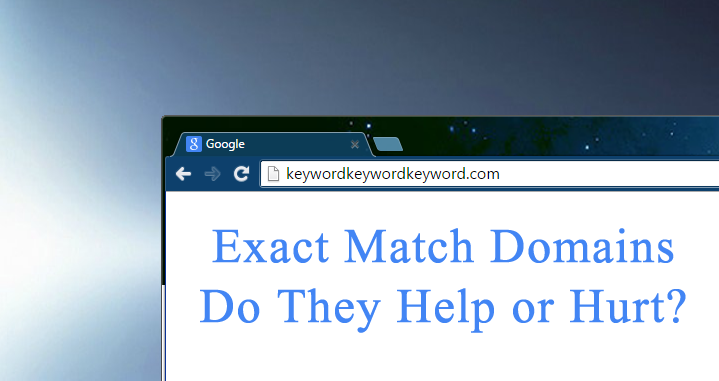 He also says that there are plenty of people that use a keyword search for an exact match domain in Google rather than typing the URL. For example people search for Facebook and they expect to see Facebook as the number one result. Even though technically it is an exact match domain, it doesn’t automatically mean that it should be considered spammy and down ranked for that reason alone. And if Google wasn’t to serve that result as number one, it would be very poor user experience, which is another reason why they don’t down rank strictly based on that. He does raise the concern that sometimes when people choose an exact match domain they fail to think about the long-term impact and how that will affect the user experience and future customers. The example was if you choose the domain name redapples.com but later you decide to branch out into oranges and bananas, you could confuse potential customers who think you only sell red apples and nothing else. Mueller also says that sometimes people try to piggyback off success, and assuming that if they get their exact match domain that their site should rank for those keywords under the guise that it’s their brand name. He said that many people confuse the fact that people just because people are searching for those keywords doesn’t mean they’re looking for your exact site that happens to have your keywords in the domain. Using the example redapples.com again – if you just arrive on the scene with redapples.com, you aren’t entitled to all the “red apples” search traffic because arguably those people are not searching for “your brand” but are just searching for the generic keywords that happens to be your domain name. So Google can serve the best quality search results to those users regardless of what keywords the domain name may or may not have in it. Many, many years ago, exact match domains were almost a sure thing with a little bit of SEO love – that is why back in the day you used to see ridiculously long exact match domains such as “buy-keyword-keyword-keyword-keyword-online-now.com”. But the success of those days has been very long gone, which is why you rarely see those crazy long domains anymore except for some super obscure and lengthy search terms. To recap, John Mueller says that you should choose the domain that reflects your business and don’t think specifically about the keywords. Instead focus on the great quality website that serves users well, and Google should hopefully reward you for. That said, having keywords in your domain name won’t hurt, but don’t bank on it giving you a big boost for that reason alone. Here is the full video queued up to the start of EMD discussion.